When will the Summit take place and where is it located? The Summit will take place March 25-28, 2019 at the Paris Las Vegas Hotel & Casino in Las Vegas, NV. How can I register and what are the registration rates? Visit the Register page for deadlines, rates, and other registration information. How do I book a hotel room and what are the rates? Visit the Hotel & Travel page for detailed information. How can I reserve exhibitor space? Visit the Trade Show page for information and to register as an exhibitor. How can my organization become a Summit sponsor? Contact Chad Marchand at chad@ncaied.org. Where can I find the agenda for the Summit? Visit the Agenda page for detailed information. Who is the National Center for American Indian Enterprise Development? The National Center for American Indian Enterprise Development is a 501(c)(3) non-profit organization. 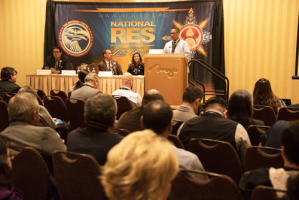 With over 40 years of assisting American Indian Tribes and their enterprises with business and economic development – we have evolved into the largest national Indian specific business organization in the nation. Our motto is: “We Mean Business For Indian Country” as we are actively engaged in helping Tribal Nations and Native business people realize their business goals and are dedicated to putting the whole of Indian Country to work to better the lives of American Indian people- both now… and for generations to come. Learn more. Who can I contact if I have additional questions about the Summit? Visit the Contact page for contact information.